So a couple of months signals no chance ever of a good service from Go-Ahead? That makes no sense to me. There is no chance of a good service unless they put an extra bus on it. There is no running time on it. Although on the plus side, we are finally getting a nice restroom at Woolwich. A very nice investment by Go Ahead as they have actually bought a whole shop. The point I was making is we are only a couple of months into a 5-7 year contract so unless people have got Mystic Meg's 'powers of clairvoyance', no one can say that there won't ever be a chance of a good service. Yeah, having driven it myself, the problem is in the peaks and on Saturdays. There is no running time on it and no stand time either. It could do with an extra 7th spreadover bus on weekdays and an extra 7th bus on Saturdays. We'll see. Maybe Go Ahead will end up forking out for an extra bus, as I can't imagine the amount of mileage they are losing and the lost QSI bonuses are coming cheap. Right now for example, going by LVF, there is one bus curtailed to Plumstead Common, one to Woolwich, and the bus that has been turned at Woolwich is running with another bus going through to QE. Refurbished 2013 VHs on the 139. This probably won’t happen. 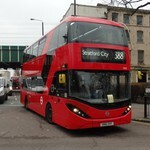 Why would an operator refurbish buses for a contract that ends in 18 months? Most refurbishments are triggered by contract renewals. If the VHs are retained on the 139 for the next contract - or if they are reallocated to another new contract - they'll be refurbished at that point. I really don't think that these VHs are in particularly bad condition anyway. Route 398: a higher frequency, maybe up to every 20 minutes Monday to Saturday with the Sunday service left as it is at every 30 minutes. Routes H9/10: frequency here is good. Maybe additional SDOs in the AM/PM peaks to assist with the loadings in the peaks. Also, longer buses could be introduced, as buses on this route do get packed to the brim. Maybe up to 10.9m or longer, depending on a route test of course. Before you ask, a low bridge at Harrow & Wealdstone Station is the reason why the H9/10 can’t take double deckers. Any route serving and terminating at Harrow Bus Station (114, 140, 182, 183, 186, 223, 258, 340, 395, 483, H9/10, H11, H14, H17 & H18/19): A Bigger Bus Station. Crossing the road at the bus station entrance and exits can be like a game of skipping stones if the bus station is congested with buses sticking their butts out into the entrance/exit crossing while trying to navigate their way into and through the bus station. Congestion along with stand space is a pretty big problem for this small bus station, especially in the peak. But possibly the biggest problem is space for a new bus station. Available land is either greeny parky areas or it’s taken by councils and redevelopment companies who use this available land to build houses. 290 double decked reverted to FW operation and extended to Hammersmith. N85 New night route over day 85 then to Waterloo via N22 to Sloane Square then 211 to Waterloo. And for our younger readers, proof courtesy of Ian Armstrongs excellent web site. Solidarity with my Muslim friends, family and neighbours, and with Muslim people the world over. In an ideal world (i.e. one in which public transport got the investment it deserves) the solution would be to completely rebuild Harrow-on-the-Hill Station, with the platforms covered by a raft on which a brand-new bus station and stand area would be laid out. Needless to say the bus station would have direct access to all platforms by lift via a fully-accessible ticket hall. As it was, plans to spend money to make Harrow-on-the-Hill accessible were cancelled under Boris Johnson's Mayoralty. What we will probably get is bus stops along College Road for through services not terminating at the Bus Station, and I can see routes 182 and 186 running directly along Station Road and not serving College Road/the Bus Station at all.